Gowans, Alan. "Parliament Buildings". The Canadian Encyclopedia, 07 June 2016, Historica Canada. https://www.thecanadianencyclopedia.ca/en/article/parliament-buildings. Accessed 22 April 2019. 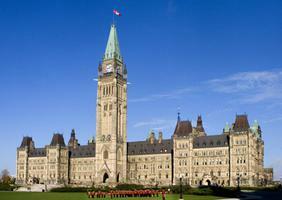 Canada’s Parliament Buildings are home to the federal government in Ottawa. Designed in a gothic revival style, the buildings officially opened on 6 June 1866, about a year before Confederation. The new structure, built to replace the old structure destroyed by fire in 1917, was designed in the Modern Gothic Revival style (photo by James H. Marsh). Canada’s Parliament Buildings are home to the federal government in Ottawa. Designed in a gothic revival style, the buildings officially opened on 6 June 1866, about a year before Confederation. On 3 February 1916, a fire destroyed all but the Parliamentary Library. Reconstruction began later that year. As the seat of Canada's federal government, the Parliament Buildings in Ottawa are a remarkable and visually striking complex of buildings located on a promontory overlooking the Ottawa River. Proposed after Queen Victoria chose the small town for the new capital in 1857, they were to provide more extensive space for a House of Commons and a Senate. Following Confederation in 1867, the newly opened Parliament Buildings became the heart of the Canadian government and a national symbol for the young Dominion. The complex of three buildings, set within a designed landscape in the picturesque tradition, is also known as the Parliamentary Precinct. Once known as Barracks Hill and used as living quarters for the Royal Engineers working on the Rideau Canal, the prominent site and open land was an ideal location for the new Parliament. Within the Precinct, the Centre Block and the Parliamentary Library are centrally located at the hill's highest point near a steep escarpment. The East and West Blocks are to each side of the Centre Block and create a public plaza facing the city's urban core. The surrounding open grounds are interspersed with monuments of important political figures who helped shape the country. At the time of Confederation, few building projects on as large a scale as the one proposed for the Parliament Buildings had been completed. 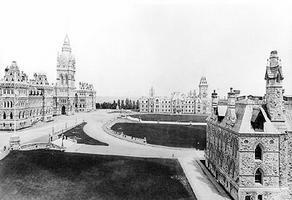 A competition was therefore organized in 1859 to find suitable architects for three federal buildings, including a Parliament building (the Centre Block), two adjacent administrative buildings (the East and West Blocks) and a Governor General’s residence(See Architectural Competitions). A wide variety of styles was submitted by architectural firms under pseudonyms to the Department of Public Works. The competitors' designs were of two general historical styles: Neoclassical, which was identified at the time with American republicanism, and Gothic Revival, which was used for the recently completed British Parliament in London, England. 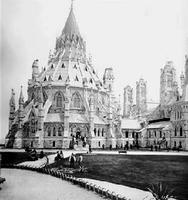 After discussions between Public Works commissioners and Governor General Sir Edmund Walker Head, the picturesque Gothic Revival style was chosen because it was thought to best represent parliamentary democracy. The Centre Block was awarded in 1859 to Thomas Fuller and Chilion Jones, and was reworked in 1863 by Fuller and Charles Baillairgé(See Baillairgé Family). The East and West Blocks were awarded to Thomas Stent and Augustus Laver. The governor general's home was never built, but the other buildings were sufficiently complete to move government departments from Québec to the new capital in 1865. Officially opened on 6 June 1866, the original Centre Block and the two administrative blocks were exceptional examples of highly developed Victorian Gothic revivalism in Canada. The High Victorian Gothic Revival was the most successful of the medieval revival styles in 19th-century Canada. The Parliament Buildings' designs developed from two streams of evolving thought on Gothic architecture. One was the influence of the English architect Augustus Welby Northmore Pugin, who saw the Gothic possessing an honest aesthetic because of its functionalism, creating buildings designed for their usability rather than their style. Pugin's ideas were widely accepted at a time when picturesque sensibilities were strong. A second influence was the notion of an authentic moral uprightness through the Gothic's high standards of craftsmanship espoused by the British theorist and Gothic apologist, John Ruskin. In Ruskin's view, Gothic architecture's highly ornate decorativeness allowed a freedom of expression to anonymous craftsmen who were increasingly inhibited by the Industrial Age and its modern materials. The Parliament Buildings reflect both branches of Victorian Gothic revivalism, but interpreted to Canadian tastes by its eclectic choice of Gothic ornament and local materials. Less elaborate predecessors to the buildings' designs include earlier secular Goth buildings, such as the robust Norman-styled University College of the University of Toronto, which in turn was inspired by the Oxford University. Each of the Parliament Buildings was designed to incorporate Gothic elements, including pointed arches, lancet windows and tracery, spires with crockets and rubble-course stonework. In Pugin's tradition, a liberal and varied composition of projecting and receding masses produced the picturesque silhouettes of the buildings and the visual legibility of the plan. Ruskinian elements include the attention to minute details of ornamentation and a strong sense of polychromy, despite the replacement of the colourful slate tile of the mansard roofs with copper in later years. When English author Anthony Trollope visited the Parliament Buildings he said: "I know no modern Gothic purer of its kind or less sullied with fictitious ornamentation." The only surviving intact portion of the original Centre Block, the Parliamentary Library best exemplifies the High Victorian Gothic Revival. The library incorporated the most current ideas in the field and was drawn to exact specifications cited by the head librarian at the time. The original Parliament Building complex had a strong impact both nationally and internationally, and established a course for federal building design over the following decades. On the night of 3 February 1916, fire broke out in the Centre Block's House of Commons reading room. All that remained the following morning were the building's exterior walls and the Parliamentary Library. Rumoured to be an act of sabotage, as Canada's energies were focused on war in Europe, the fire was simply an unfortunate accident and caused great alarm within the federal government. Undeterred, the government would rebuild the Centre Block immediately. Architects John A. Pearson and Jean-Omer Marchand were selected to redesign the Centre Block in a style sympathetic to the original, but using modern materials and spatial planning. Reconstruction officially began on 24 July 1916 after a Joint Parliamentary Committee had finalized the architects' proposal. Initially, the architects intended to rebuild on the footprint of the former Centre Block, but a decision to include more office space meant that an additional floor was incorporated. As a result, what was left of the original walls and the rubble foundation were demolished and rebuilt with load-bearing concrete walls and a steel frame. Unlike the former Centre Block, the new building used a symmetrical bi-axial plan sequenced with major and minor corridors laid out according to principles espoused by the École des Beaux-Arts in Paris. (Marchand was one of the first Canadian architects to graduate from the school in 1903.) The Beaux-Arts method of organizing space was achieved separately from a building's surface decoration or application of style, and this approach is well illustrated in the Centre Block's main axis corridor linking the Parliamentary Library with the main public entrance. The two houses are aligned on secondary axes at each end of the building, which are connected to the impressive two-storey Confederation Hall. Over seven years were required to build most of the new Centre Block, which remained incomplete until the central Memorial Tower was officially opened on 11 November 1928. Although the new Centre Block was intended to respect the original design, it is fundamentally a building belonging to the 20th century and Canada's wartime experience. It is stylistically sympathetic to the original's High Victorian Revival style in its recreation of the mansard-roofed end pavilions, the central tower, and in its use of local stone and intricate ironwork. Inside, the two-storey Confederation Hall and the double-height chambers of each house are similar to the original. The new building was, however, a memorial to the Canadians who fought in the First World War and exhibited through its design a stronger sense of nationhood. Throughout the building there are reminders of its dedication to the valorous fallen soldiers, including a Memorial Chamber at the base of the tower containing a record of each soldier's name. A more discreet reminder is a small engraving on the west wall of the building noting the capture of Vimy Ridge during a decisive battle that had a deep impact on the country's national image both at home and abroad. A new sense of Canadian identity and iconography is evident throughout the building, which features symbolic carvings using materials and motifs from across the country. This evidence of a national consciousness differentiates the second from the first Centre Block. The landscape of the grounds is distinctly different from the grid-like plan of central Ottawa. Distinguished by its composition of formal and informal areas creating a picturesque landscape, the precipitous site was the obvious choice for the location of the Parliament Buildings. The land surrounding the new buildings was neglected until 1873 when New York-based landscape architect Calvert Vaux drew up plans for the grounds without visiting Ottawa. His plan for a rising curving roadway with elegant staircases leading to a wide upper terrace unified the sloping stages between the street and the hill's highest point. Surrounding the formal grounds is an intimate walkway along the edge of the rugged escarpment with views across the Ottawa River out to the Gatineau Hills. The public can stroll the grounds and at one time had access to a "lovers' lane" down the hill's escarpment. Commemorative monuments of political and royal figures are carefully positioned throughout the grounds with the setting in mind. Individuals involved in the founding of Canada, seven former prime ministers and royalty have statues erected in their honour. The centennial year of Confederation (1967) is remembered by a perpetual flame, called the Centennial Flame, alight in a fountain at the front entrance gate. In 2000, Parliament's commemorative program widened to include an ensemble of figures depicting the "Famous Five" women who were involved in spearheading the Persons Case. The most notable monuments were designed by prominent Canadian sculptors, including Louis-Philippe Hébert, Walter Allward and Frances Loring. The Parliament Buildings have come to be an enduring and important national symbol for Canada, and as such, the federal government has instituted an extensive heritage conservation program to preserve both the architectural and heritage values identified with the complex and grounds. Awareness of the buildings' importance was not always the case. In the late 1950s, as demand for parliamentary office space became acute, the government decided to demolish the West Block and replace it with a large modern office building. Public outcry forced the government to reconsider the plan and to renovate the building instead. Over recent decades, each building has undergone a sensitive conservation process, preserving the glory of these buildings for the Canadian public. Rare among national parliaments of the world, the Parliament Buildings' open grounds provide a place of gathering for both celebration and protest alike. The hill was a local public meeting site before the buildings were constructed. After their completion, people continued to visit the grounds in honour of special occasions, including royal jubilees, state funerals and other significant events. Public protest and rallies were recorded as early as the 1870s, but regular organized protest was a phenomenon that appeared after the Second World War. Vital to the Parliament Buildings' character today are both its celebrations, including annual Canada Day festivities and the ceremonial Changing of the Guard, and its role as a democratic forum for citizens. These functions combine to reinforce the Parliament Buildings as the centre and symbol of Canada's federal government. Parliament of CanadaExtensive website of the Parliament of Canada. OttawaThe website of the City of Ottawa.